This article presents an update on the methods used by the Mumbai terrorists: technology in the form of BlackBerry phones and Internet access. This shows a level of planning and organization that is unusual for most terrorist groups. However, it probably won't be the last time we see the bad guys using technology for sinister purposes. By change, one of the security luminaries that I follow sent a link to the Malware Database site. If you want to stay current on the latest and greatest reports of malware in the wild, this is a must. There's also a Twitter account so you can get the latest malware news as Twitts. Excellent post from Security4all about the need for and the way to ensure that offline virtual machines are patched in a timely (and automated) manner. Patching solutions such as the ones discussed for Microsoft and VMWare will likely be the main differentiator between the virtualization leaders and their open-source competitors. This posting provides an update to the concept of "No Tech Hacking" which has made Johnny Long a commodity name in the InfoSec arena (Google video and book). Richard Stiennon is right on about the dangers that this Web 2.0 world poses to our daily lives. We are leaking information left and right, and there doesn't seem to be an end to it. Larry Pesce of PaulDotCom.com has been working on his SANS paper, and has numerous postings (latest one here) about tools like MetaGooFil and others to extract information from local and web documents. There are days when I just ponder if we're doomed to continue to create "security solutions" that are double-edged swords. Today's solution is one unveiled by Lenovo, which would let users register up to 10 cell phones allowed to disable a laptop remotely. How long before spammers start sending text messages to all cell phone numbers with the command: remote-erase-all-data-now? This news post from Christopher Dawson exemplifies the problem that plague most of today's Windows-based distribution: licenses and drivers. On the licensing side, the user is faced with a barrage of cryptic codes to enter, if they remember where they put the license key in the first place. How about coming up with word-based licenses instead G6QRH five times? On the driver side, my own experience echoes that of Mr. Dawson in that both Dell and HP's service tags manage to recognize the machine but present an array of choices regarding hardware drivers. How is a user to know which particular version of a network card or sound card one has? Why can't manufacturers code that level of detail into their license tags? Please don't mention HPA (Host Protected Access), a special area of the disk where manufacturers "store" (hide?) drivers and restoration software. Ubuntu, a free Linux distribution with the look and feel of Windows, will install and recognize most hardware without ever asking for a license or a driver. We need technology that simply works instead of getting in the way. 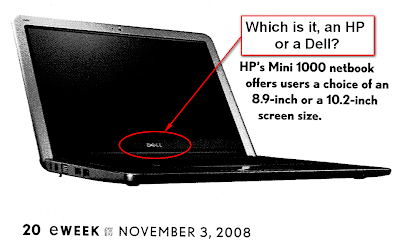 Update on 11/25/2008: still showing up on BusinessWeek's Technology page. Earlier this month, Douglas MacMillan wrote a story for BusinessWeek about scammers and the dangers to your online identity. The article featured Shawn Moyer and Nathan Hamiel and their successful scam: convincing fellow LinkedIn users (many of which are security professionals themselves) that they were the real Marcus Ranum (CSO of Tenable Network Security). By chance, I happen to see the article on Twitter and leave a comment. The comment got picked up and I was asked by BW to provide a photo and give my blessings to be featured on the front page. Many thanks to Stiennon's Twitts, the Security Bloggers Network and the Security Twits group for all of the positive attention. The cost of ignoring spammers is simply too high; now Microsoft needs to repair its PR image from the latest snaffu: being listed as 5th (now 6th) most spam-friendly ISP. The rating, from Spamhaus.org’s list, points to several current issues that Microsoft has simply not resolved yet including allowing hotmail scams, file repositories used by hackers, and web spaces used by hackers. Who will make the list next? Privacy advocates argue that academic institutions should hire full-time privacy officers to focus solely on privacy as "the job of security officers is to protect data that are already collected — not to ask whether the data should be captured and stored in the first place." This article exposes a salient truth about the academic sector. In the past two weeks, I have come across two instances where academia has appeared clueless when it comes to data security and privacy. One is contained in the article below ("what's a CPO? "), the second was posted on the social networking site Twitter by a frustrated security professional who was dumb-founded to have to explain the term "penetration test" to a group of Computer Science PhDs. SunTzuData, the company behind the SUMO Linux distro was founded by Marcus Carey. Marcus used to work for Computer Sciences Corp. (CSC) and was assigned to the DC3's Defense Cyber Crime Investigations Training Academy (DCITA) as a Researcher and Instructor. I think it's time for these social networking sites to spend some of their money to validate new users' identity (would be nice to double-check existing users as well). They could learn something from the Google Knol's Name Verification program that can validate an identity based on a Credit Card or via phone directory (weaker IMHO). Very useful feature of NoScript (browser plugin for Firefox) that allows you to force web sites to stay on the HTTPS side of things after authentication, instead of reverting back to plaintext HTTP. The Manchurian Chip - The news that shook the world! If this story is to be believed then we're in for a whole lot of trouble, assuming we can do something about it of course. Suddenly your ten-year-old computer does not look so useless anymore. When ET calls home to China, everyone needs to pay attention. Two stories published within days of each other reporting on the current biggest challenge: the human factor. At least one of my fellow bloggers, Jeff Evenson over at CulturedSecurity.com has made the human factor in security the focus of his writings. Well, someone was going to invent it and market it: a sim card to unlock the iPhone 3G. We're sure to see more of these special-purpose chips to modify otherwise locked, or worse - secured, mobile devices. Here lies a big problem with the usability of today's software regarding the privacy and security of data. The article points out that when using Google Maps, "Users of the service tend to assume that information entered is available only to themselves as the site promotes itself as an exclusive map for individual users." We need a shift in the way we think about data, starting from the decision of what to collect, how things are presented (Human-Computer Interface), and how things are stored/communicated/processed. Until we do, these kinds of accidental data leaks will continue to occur due to human error or, in this case, erroneous assumptions. Consumer Reports (CR) has put together a great resource called the Guide to Online Security. One of the features of that site is what CR calls Go Phish (opens in a new window) in which you have to determine whether each of 12 different emails is real or fake. Can you achieve a perfect score? 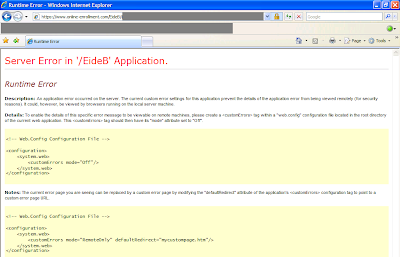 It's disappointing to see this kind of error in 2008 from a company like Eide Bailly. Since it's Saturday, it will most likely be a while before the site is back up and running. It appears that GoogleDocs is once again broken. This time, it shows phantom shared documents with folks that I've never met (and don't know). Disappointing. Success in security depends on either automating the fix or making it really easy for the user. -- Stephen Northcutt, President of SANS Technology Institute, SANS NewsBites Vol 10 No 89. As pointed out by one of the maintainers of the SANS ISC (Internet Storm Center), WPA/TKIP has been broken (in one direction, from WAP to Client). An excellent explanation of how this is done can be found here. Talking about the confusion of many European Data Protection Authorities (DPAs) as to whether the IP data Google is collecting is private or not, Peter Hustinx, European Union's Data Protection Supervisor, affirmed that IP addresses and server logs should be treated as personal data. As Google itself acknowledged, IP address data is sometimes private and sometimes not. Hustinx basically seeks to remove any confusion on the part of the EU DPAs so that if the DPAs can't clearly determine if sometimes the data is private and sometimes not, it should be considered to be private and protected as such. The RBN (Russian Business Network) is reportedly behind one of the greatest repository of stolen financial information. According to the RSA FraudAction Research Lab, it uncovered more than a half million credit card numbers and online bank account logins and passwords, apparently acquired by the RBN over the past 2.5 years. Malware has increased in complexity and capability; the Sinowal trojan used in this attack can show the user a fake login page, luring the user to provide valid credentials which are then transmitted by the malware to a server in a remote location/country. The security community has been raising the alarm for some time; now we have proof: new, never-seen (hence the "zero-day") exploits for as low as $10. What's next? Will the future be more secure? It'll be just as insecure as it possibly can, while still continuing to function. Just like it is today. This story illustrates how many companies are still not ready to handle computer-related emergencies. A former system administrator removed critical operating system boot files. He reportedly wanted to cause "a small hickup", however "the company inadvertently caused more damage while trying to repair the situation." There is no reason why missing boot files would have taken days to repair if the company had implemented appropriate incident response and business continuity plans. In my own home environment, I can be back up and running in less than 10 minutes should my entire operating system get trashed. Why can't a company do the same?